WPBackItUp Safe is the new top-secret product we’ve been working on for the better part of a year. It adds a layer of security to your backups by saving them to multiple locations. But before we get into the solution, let’s first explore the problem. Imagine logging into your computer, opening your server folder, and finding your backup files missing. This is an issue that can happen to anyone at any time, and it can lead to numerous problems if you need to restore a recent backup. Thankfully, it’s possible to avoid such an occurrence, and that’s by ensuring your backup files are saved in multiple locations. Not only will this keep them safe from loss, but it will also provide you with peace of mind. Our new product WPBackItUp Safe addresses this issue by providing the ability to seamlessly store your backups in multiple locations. In this article, we’ll discuss how WPBackItUp Safe tackles this problem a little differently than other WordPress backup plugins. If you’re interested in joining the fun and helping us test out WPBackItUp Safe then you can signup here. Once we received your info we’ll be in touch with instructions. Thanks in advance for participating! WPBackItUp Safe is an extension to WPBackItUp Premium that allows you to store your backups “offsite” in location(s) not associated with your hosting provider. 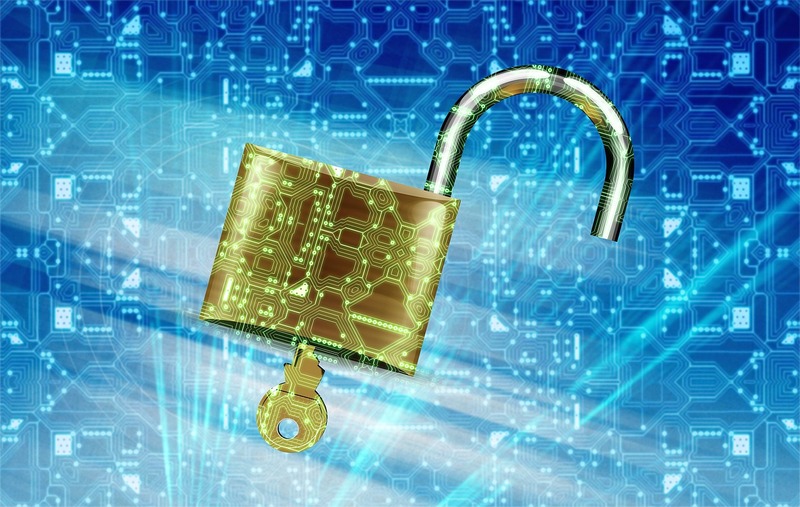 This is favored by many businesses for obvious reasons, including protection against local server crashes, data hacks, and accidental deletion. Cloud-based storage is a type of offsite storage that has additional benefits like being extremely resilient and accessible making it a great choice for backups. WPBackItUp Safe is our solution for making offsite storage of your backups easy. Which Offsite Storage Options are Available? When we began designing WPBackItUp Safe we began by identifying the storage options we wanted to support. That list quickly became very large so we decided to narrow it down to a handful of options that we felt would provide the most value to our customers and that we could deliver in a reasonable amount of time. But which ones should we start with? To answer that question we decided to poll our customers to find out which option would be the most beneficial. Thanks to our great customers we received lots of feedback indicating that Dropbox and Gdrive were the most popular options. The chart below shows the top 8 ranked by popularity. As you can see DropBox and Gdrive were actually neck-and-neck. Since we use Dropbox quite often on our support team we decided to make it the first Cloud-Provider offered. However, this is just the start for WPBackItUp Safe. So if you were one of the people that wanted Gdrive or OneDrive, then fear not. We have already begun work on additional cloud-providers and plan an aggressive rollout in 2018. If you missed our initial poll and want to weigh in on future cloud-providers then take a few moments to answer these 5 questions and let us know which are most important to you. Why Do I Need WPBackItUp Safe? Simply put, backups need to be stored in multiple locations to be considered safe. So when thinking about backups you should also be thinking about redundancy. The more places you store that backup, the more options you will have if you ever need it. I can’t tell you how many times a customer has contacted me saying they need to restore their site but have misplaced their backup. It seems silly but trust me, it can happen to anyone. This is one of the reasons we created WPBackItUp Safe – to make it easy to store your backups in multiple locations. 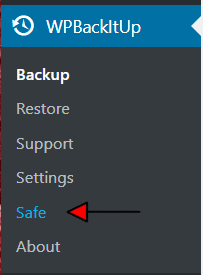 WPBackItUp Safe was designed to make redundancy simple. WPBackItUp Safe also support backups of ANY size. We took large files and network failures into account from the beginning so WPBackItUp Safe will break your HUGE backups into small pieces, sending them a little bit at a time until the entire backup has been stored successfully. These two key benefits are what separates WPBackItUp Safe from all the other WordPress Backup Plugins. How Does WPBackItUp Safe Work? WPBackItUp Safe was created as a separate plugin that works with WPBackItUp CE and Premium. It’s installed just like any other WordPress plugin via the admin dashboard. The second reason was that we wanted to reduce the impact to WPBackItUp CE and Premium. We wanted to encapsulate everything related to offsite storage in this single plugin, making minimal changes to WPBackItUp. Over the course of last year we have rolled out many updates to WPBackItUp to support WPBackItUp Safe so if you are on the latest version then it will support WPBackItUp Safe. Once WPBackItUp Safe is installed, a new WPBackItUp menu item will appear. This is how you access the WPBackItUp Safe dashboard. The WPBackItUp Safe dashboard displays the status of all your recent cloud uploads. From this dashboard, you will be able to see the status of cloud uploads that are currently in progress and ones that have recently completed. You will also be able to see the percentage of usable cloud storage allocated to your backups. This gives you an idea of how much storage you are utilizing on each cloud storage provider. The blue progress bar shown below indicates the status of all the backups currently being uploaded. So if you have a number of backup files being uploaded then you will be able to see the percentage complete for all of them. Lastly, the grid at the bottom of the page shows all your recent cloud uploads by cloud storage provider. Uploads in progress show percentage complete and may be canceled if needed. There are some changes to WPBackItUp too! You will notice a new icon in your available backups listing. This icon indicates the status of your cloud backup. A grey cloud indicates a backup has not been uploaded to the cloud provider. Blue spinning arrows indicates the upload is in progress. A blue cloud with the check indicates the uploaded completed successfully to all providers. A red explanation point indicates an error occurred. New backups will automatically be uploaded but you may also initiate an uploaded at any time by simply clicking the cloud status icon. When clicked, you will be prompted with a list of cloud storage providers to chose from. One or all providers may be selected. If your backup already exists in the cloud then don’t worry, WPBackItUp Safe will not upload it again. Once selected your backup will be uploaded to the selected cloud storage provider. While the upload is in progress you will see a spinning set of blue arrows. I am sure you are all wondering about pricing at this point. We are still discussing pricing for WPBackItUp Safe but have decided that there will be no additional charge for WPBackItUp Premium customers. If you are an existing WPBackItUp Premium customer, then there will be no additional cost for WPBackItUp Safe. However, it is very likely that cloud providers like AWS S3 and DropBox business providers will only be included with WPBackItUp Professional and Premium pricing tiers. 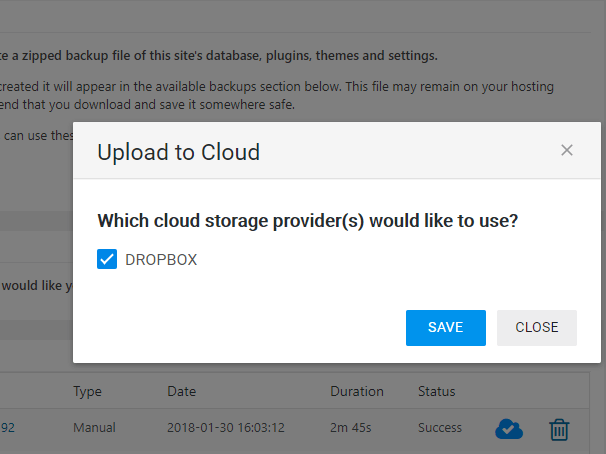 The DropBox Personal provider we are making available today will be included in all pricing tiers so if you have WPBackItUp Premium then you will get WPBackItUp Safe and the DropBox Personal cloud provider at no additional cost. During the Beta period, we will provide WPBackItUp Safe and the DropBox Personal provider free to everyone, even Community Edition Customers. So if you would like to participate in the beta then it is open to everyone. We have been running WPBackItUp Safe on wpbackitup.com for many months now and are finally ready to allow some customers to get their first peek. If you’re interested in joining the fun and helping us test out WPBackItUp Safe then you can signup here. Once we received your info we’ll be in touch with instructions. Have questions or comments? Let us know in the comments section below!